Killington is the biggest ski area in Vermont, and eastern North America. You’ve heard the many nicknames, The Big K, The Beast of the East, K-Mart, call it what you will – Killington is big, bold and it boasts the longest ski season in Vermont. A few of Killington’s fall line accolades – two high-speed heated gondolas, 12 comfy quads and the world’s most extensive snowmaking system. Killington is the biggest ski area in the Northeast with 155 trails, and 21 lifts, and a beautiful Peak Lodge at the 4,142′ summit reached by the K-1 Gondola. Killington has super sized snowmaking power too, over 1,500 snow guns, so it is usually the first ski resort to open in the East. Opening day for Killington October 19, exclusively to season pass holders, the next day for the public, first in New England, just like 2017 -2016. Killington hosts the World Cup Women’s FIS races in November over Thanksgiving weeked, the 3rd year consecutively. Killington typically aims to ski Halloween each season, occasionally tied with Sunday River, and spins the Superstar Quad through May. Killington’s ski season ends around Memorial Day most seasons. You can ski six peaks, and six months here at Killington. That’s where they come up with their Best of the East slogan – big place, beastly snowmaking, long ski season! 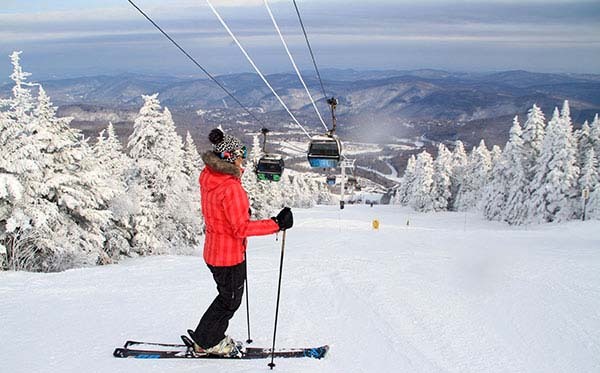 Killington Peak is where you find the most classic ski trails with the best views of Vermont, seeing Stratton, Magic and Okemo in the distance. The Peak Lodge, new in 2014, is a fantastic window-lined summit lodge serving Vermont local fare in a fun casual cafe style environ. Ram’s Head Family Center has everything you need from daycare to ski camp to get your family skiing, and its walking distance to the Killington Grand Resort Hotel. Bear Mountain is home to Killington’s Terrain Parks, including the Under Armour Dream Maker Terrain Park and a 22′ Superpipe which plays host to the annual Dew Tour among other big ski and snowboard events. Killington also has a Burton Stash -an all natural feature terrain park located in the woods off Killington’s Bear Peak. Family friendly ski lodging is plentiful in Killington, with some ski in ski out condos, and the Killington Grand Resort Hotel – which has a fantastic outdoor heated pool with a view of the slopes. Many inns, condos and hotels line the Killington Access Road. For dining and après ski, Killington is reputed for its bars along the Access Road at the Foundry, Pickle Barrel, Wobbly Barn or Jax, and slopeside at the Umbrella Bars. Killington definitely makes our Top Apres Ski Resorts in the East list. If you are travelling with the kids to Killington, then Casey’s Caboose, Sushi Yoshi or Outback Pizza are good choices with a family-friendly apres ski scene. For a quieter lodging , stay at Pico Resort just down the street and ski their slopes as well, the resorts are sisters. Pico Mountain’s slopeside condos and the Sports Center are perfect for ski families. Aside from lodging at Killington or Pico, there are several affordable chain hotels, motels, inns and bnbs in nearby Rutland. If its a romantic ski getaway, then hideaway at The Red Clover Inn in a lovely suite with exceptional dining served in the beautiful Vermont inn, with an outdoor hot tub – private with a view of Pico Peak. Killington is a Powdr Corp mountain along with Copper Mountain in Colorado, Mt Bachelor in Oregon, and Las Vegas Ski and Snowboard Resort.